NEW YORK (WABC) -- The Mets began the offseason process of rebuilding by making a choice at the top. Cleveland's pitching coach Mickey Callaway takes over for Terry Collins as the new skipper of the Mets. Despite no managing experience first reviews of Callaway appear to be positive. 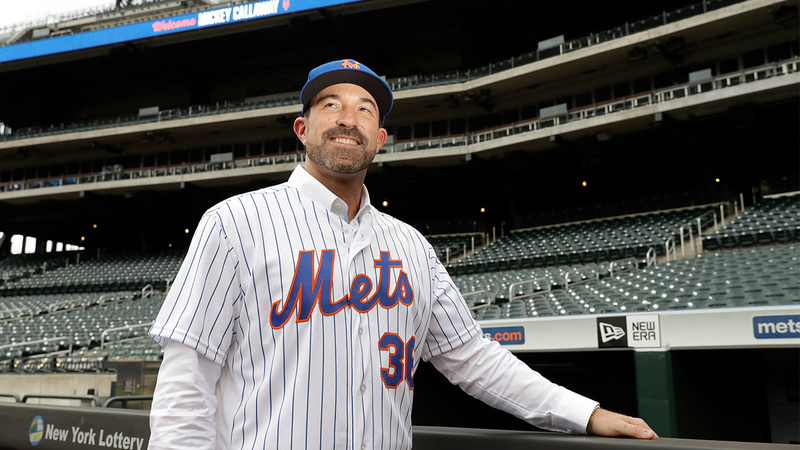 Callaway said all the right things in his official Mets introduction, saying the organization will take care of their own to build a cohesive and winning team. Ok, we'll take the skipper's word for now, but he needs to produce a winning team on the field. The Mets are coming off one of their most disappointing seasons in franchise history. A team talked about as a World Series contender just folded due to injury and bad play. It is up to Callaway to change the culture. 1. Healthy Pitchers. This is the biggest key to the team. 5 out of 6 starters missed considerable time in 2017. Callaway knows pitching, he needs to find a way to keep his starters on the field for this team to have any chance. 2. Cespedes Turnaround. 2017 was nothing short of a disaster for Yoenis Cespedes. The slugger missed most of the season with hamstring problems. He is the big bat in the middle of the order that can make a difference. Callaway needs to keep him healthy and hungry. As long as we are talking outfield, the return of Michael Conforto from a shoulder injury is a big key. The lefty slugger is the second best offensive weapon the team has. 3. Who's on First, second and Third? The infield needs some definition. Outside of shortstop, the Mets have question marks at every position. Is Dom Smith and everyday first baseman? Is Jose Reyes in the plans? Is David Wright in the plans? So many question with few answers. 4. Bullpen woes. The Mets need to rebuild the bullpen. The Yankees showed how a deep pen can lead to wins. The Mets need to find several arms they can trust. So, Mickey Callaway has a busy and big offseason as he tries to make the tough decisions to get the Mets back on track.